Rumsfeld said “any kind of moral or intellectual confusion about who and what is right or wrong can weaken the ability of free societies to persevere” in any long war. For they do not merely serve to impugn the morality or intelligence – indeed, the loyalty — of the majority of Americans who oppose the transient occupants of the highest offices in the land; Worse, still, they credit those same transient occupants – our employees — with a total omniscience; a total omniscience which neither common sense, nor this administration’s track record at home or abroad, suggests they deserve. Of course I’d be willing to spend all that and more to combat terrorism, but I’m less eager to spend it to fight the threat of all the WMD’s in Iraq. There you have it – Ann Coulter is objectively pro-opium. This has been posted in various places recently, but I happened to find it independently and thought I’d pass it on as though I was really cool. 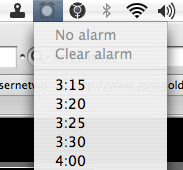 TinyAlarm sets an alarm for a time of your choice. It sits in the menubar of OS X (you do have a Mac, right?) so it’s always available, and has a very simple interface. The whole idea is that it’s simple, and it is. Perfect for tracking when your dinner is ready, when you’ve blasted through an hour of work and are due 5 minutes of sudoku, or of course when it’s the earliest you could possibly leave work on a Friday.